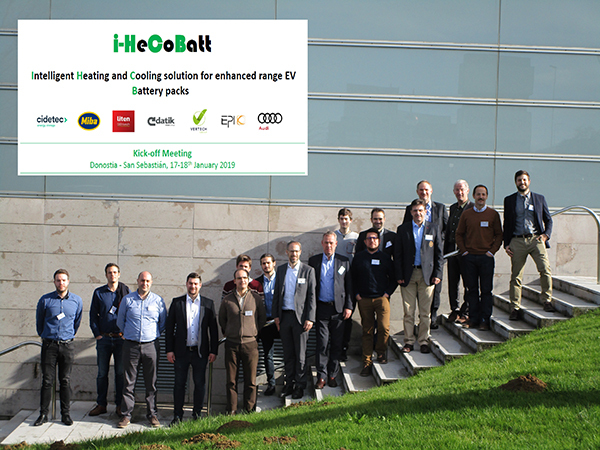 The European i-HeCoBatt project held its launch meeting on 17 January at the CIDETEC Energy Storage headquarters in Donostia-San Sebastián. i-HeCoBatt has a budget of €3.3 million over a period of three years, and is funded by the European Commission's H2020 programme under the Green Vehicles programme. In order to significantly reduce CO2 emissions in Europe there will have to be a massive introduction of electric vehicles onto the market. However, some obstacles still persist in this respect, such as high cost, relatively long charging times and a range that is generally lower than users' expectations. In order to overcome these challenges it will be essential to make progress in several technological aspects relating to batteries, one of which is the cooling system, which is essential for optimum battery management but at the price of cost and weight. Against this backdrop, i-HeCoBatt aims to develop an intelligent, highly energy-efficient thermal battery management system that lowers costs and minimises weight, enabling the batteries to be kept at their optimum operating point at all times - including during extreme weather conditions. The project consortium, coordinated by CIDETEC Energy Storage, brings together seven partners from four European countries (Germany, Austria, Spain and France), and is strongly geared towards industrial development, being made up of five companies and two technological institutes. As an example of this product focus, it is worth mentioning the presence in the AUDI consortium, who will test the refrigeration systems that will be developed in real electric vehicles for their validation. It is also worth highlighting the Basque presence in the consortium led by DATIK, a company belonging to the IRIZAR Group, in charge of operational data transfer and remote management of the innovative refrigeration systems, as well as CIDETEC Energy Storage itself, which acts as coordinator and is responsible for modelling and simulation tasks at a system level.